A father cruel, and a step-dame false; A foolish suitor to a wedded lady, That hath her husband banish'd;—O, that husband! My supreme crown of grief! and those repeated Vexations of it! Had I been thief-stol'n, As my two brothers, happy! but most miserable Is the desire that's glorious: blest be those, How mean soe'er, that have their honest wills, Which seasons comfort. Who may this be? Fie! I have a a cruel father, a lying stepmother, a silly suitor who wants to marry a married woman whose husband is banished—Oh, what a husband! He's the biggest reason for me to be sad! And those other annoying people make that sadness worse! If I'd been stolen like my two brothers, I would have been happy! Noble people who want something and don't get it are the most unhappy. People are lucky who can do what they want, however poor they are, which makes a good situation even better. Who is this? Go away! Madam, a noble gentleman of Rome,Comes from my lord with letters. Ma'am, a noble man from Rome has brought letters from my master. Change you, madam?The worthy Leonatus is in safetyAnd greets your highness dearly. Did you just turn pale, ma'am? The good Leonatus is safe and greets you with love. He gives her a letter. Thanks, good sir:You're kindly welcome. Thank you, sir. You're very welcome here. [Aside] All of her that is out of door most rich! If she be furnish'd with a mind so rare, She is alone the Arabian bird, and I Have lost the wager. Boldness be my friend! Arm me, audacity, from head to foot! Or, like the Parthian, I shall flying fight; Rather directly fly. [To herself] She's very beautiful on the outside! If her mind is as outstanding as her looks, she's as much better than other women as the phoenix is better than other birds, and I have lost my bet. I should be bold! Boldness, make me strong from head to foot! Or I'll have to shoot at her while running away, like the Parthians do. It would be better to run away at once. [Reads] 'He is one of the noblest note, to whose kindnesses I am most infinitely tied. Reflect upon him accordingly, as you value your trust— LEONATUS.' So far I read aloud: But even the very middle of my heart Is warm'd by the rest, and takes it thankfully. You are as welcome, worthy sir, as I Have words to bid you, and shall find it so In all that I can do. [Reading the letter] "He's one of the men with the best reputations, and I owe him a lot for his kindness. So treat him well, if you want to be trusted.—Leonatus." I'll only read this part aloud. The rest of it warms my whole body, even the deepest part of my heart. I am grateful for it. You are as welcome as it's possible to be, and you'll see it's true from what I do for you. Thanks, fairest lady. What, are men mad? Hath nature given them eyes To see this vaulted arch, and the rich crop Of sea and land, which can distinguish 'twixt The fiery orbs above and the twinn'd stones Upon the number'd beach? and can we not Partition make with spectacles so precious 'Twixt fair and foul? Thanks, most beautiful lady. Are men crazy? Has nature given them eyes to see the sky and the rich crops that come from the sea and the land, to tell apart the fiery stars above from the equal number of grains of sands on the crowded beach? And can we not use these amazing instruments to tell the difference between good and bad? It cannot be i' the eye, for apes and monkeys 'Twixt two such shes would chatter this way and Contemn with mows the other; nor i' the judgment, For idiots in this case of favour would Be wisely definite; nor i' the appetite; Sluttery to such neat excellence opposed Should make desire vomit emptiness, Not so allured to feed. It can't be his eyes that are bad, because even monkeys looking at two women like this would pick one by making noises at her and make faces at the other one. It can't be his common sense, because idiots would definitely know the right answer when deciding which was better. Or desire, because messiness contrasted with such neat superiority would make anyone throw up rather than desire the messy one. Come on, what's the matter? The cloyed will, That satiate yet unsatisfied desire, that tub Both fill'd and running, ravening first the lamb Longs after for the garbage. He's stuffed himself, he's satisfied his desire but is not satisfied, he's a tub that's filled but still emptying out, he's devoured the lamb and now is hungry for garbage. What, dear sir,Thus raps you? Are you well? What's wrong with you, sir? Are you well? Beseech you, sir, desireMy man's abode where I did leave him: heIs strange and peevish. Please, sir, go find my servant where I left him. He's strange and grumpy. I was going, sir,To give him welcome. I was just going, sir, to welcome him. How is my husband's health? Is he well? Is he happy? I hope he is. Exceeding pleasant; none a stranger thereSo merry and so gamesome: he is call'dThe Briton reveller. He's very good company. There's no other stranger there so happy and eager to play games. He's called the British partier. When he was here,He did incline to sadness, and oft-timesNot knowing why. When he was here, he used to be sad a lot, and often didn't know why. I never saw him be sad. He has a companion, a Frenchman, a well-known man, who is in love with a French girl back home. He's always sighing like a furnace for her, while the cheerful Briton—your husband, I mean—laughs deeply, and cries out: "Oh, I think I'll split my sides laughing, just thinking that any man who knows by history, other people's stories, or his own experience, what women are like, no—what they can't help being like, would spend his free time pining for a woman who would make him her slave!" Ay, madam, with his eyes in flood with laughter: It is a recreation to be by And hear him mock the Frenchman. But, heavens know, Some men are much to blame. Yes, ma'am, crying with laughter. It's such fun to be near him and hear him make fun of the Frenchman. Heaven knows, some men do terrible things. Not he: but yet heaven's bounty towards him might Be used more thankfully. In himself, 'tis much; In you, which I account his beyond all talents, Whilst I am bound to wonder, I am bound To pity too. Not him. But the gifts the gods gave him could be used better. It's terrible for him. But seeing you , who belong to him more than all the coins he owns, I have to feel amazement and pity. Two people, with all my heart. Am I one, sir?You look on me: what wreck discern you in meDeserves your pity? Am I one of them, sir? You're looking at me. What disaster do you see in me that deserves your pity? Lamentable! What,To hide me from the radiant sun and solaceI' the dungeon by a snuff? Horrible! How could he hide from the bright sun and find comfort in a dungeon with a candle? I pray you, sir,Deliver with more openness your answersTo my demands. Why do you pity me? Please, sir, answer my questions more clearly. Why do you pity me? That others do— I was about to say—enjoy your— But It is an office of the gods to venge it, Not mine to speak on 't. Because other people—I was about to say—enjoy your—but it's the gods' job to revenge this, not mine to talk about it. You do seem to know Something of me, or what concerns me: pray you,— Since doubting things go ill often hurts more Than to be sure they do; for certainties Either are past remedies, or, timely knowing, The remedy then born—discover to me What both you spur and stop. You seem to know something about me or that has to do with me. Please—since worrying that things have gone wrong is often worse that knowing that they have, and it's either too late to change something you know has happened or, knowing about it in time, you can find a way to fix it—tell me what you want to say and why you've stopped yourself from saying it. Had I this cheek To bathe my lips upon; this hand, whose touch, Whose every touch, would force the feeler's soul To the oath of loyalty; this object, which Takes prisoner the wild motion of mine eye, Fixing it only here; should I, damn'd then, Slaver with lips as common as the stairs That mount the Capitol; join gripes with hands Made hard with hourly falsehood—falsehood, as With labour; then by-peeping in an eye Base and unlustrous as the smoky light That's fed with stinking tallow; it were fit That all the plagues of hell should at one time Encounter such revolt. If I had this cheek to kiss (this hand whose touch, whose every touch, would force the person who felt it to swear an oath of loyalty) and you to look at, who capture my eye's wild movement, fixing it here on you—If I, damned at once for it, slurped on lips as common to all as the stairs that go up to the Capitol building, if I gripped hands made hard by telling lies every hour (as though telling lies were the same thing as manual labor), if I peeped into an eye as lowly and dull as the light given off by a cheap smoky candle, it would be right for all the plagues of hell to come punish me for this rebellion. My lord, I fear,Has forgot Britain. I'm afraid that my husband has forgotten Britain. And himself. Not I, Inclined to this intelligence, pronounce The beggary of his change; but 'tis your graces That from my mutest conscience to my tongue Charms this report out. And himself. It's not me who's claiming that the exchange he's made is so bad it leaves him a beggar. It's all your good qualities that draw out this report of his activities from my conscience, which would prefer to remain silent, and make me say this out loud. O dearest soul! your cause doth strike my heart With pity, that doth make me sick. A lady So fair, and fasten'd to an empery, Would make the great'st king double,— to be partner'd With tomboys hired with that self-exhibition Which your own coffers yield! with diseased ventures That play with all infirmities for gold Which rottenness can lend nature! such boil'd stuff As well might poison poison! Be revenged; Or she that bore you was no queen, and you Recoil from your great stock. Oh poor thing! Your situation strikes so much pity into my heart that it makes me sick. A woman so beautiful, and who comes with a kingdom, would double the value of even the greatest king. But you're shared with whores paid with your own money! Add to that his terrible unnatural plans to gamble with all kinds of disgusting people for gold! These spotted people could poison poison! You should get your revenge. Or your mother was no queen, and you're letting down your noble family. Revenged! How should I be revenged? If this be true,— As I have such a heart that both mine ears Must not in haste abuse—if it be true, How should I be revenged? Revenge! How would I take my revenge? If this is true - but I am so in love that I should not be willing to believe rumors I hear - if it's true, how would I get my revenge? Should he make me Live, like Diana's priest, betwixt cold sheets, Whiles he is vaulting variable ramps, In your despite, upon your purse? Revenge it. I dedicate myself to your sweet pleasure, More noble than that runagate to your bed, And will continue fast to your affection, Still close as sure. You should think, "Is it right for him to make me live, like a nun of the goddess Diana's, lying between cold sheets?" while he's leaping over differently-sized hurdles, injuring you and your bank account? Take your revenge. I'm available for your pleasure. I'll treat you more nobly than that runaway from your bed, and I will continue to love you, secretly and surely. Let me prove my willingness to serve you by kissing you. Away! I do condemn mine ears that have So long attended thee. If thou wert honourable, Thou wouldst have told this tale for virtue, not For such an end thou seek'st,—as base as strange. Thou wrong'st a gentleman, who is as far From thy report as thou from honour, and Solicit'st here a lady that disdains Thee and the devil alike. What ho, Pisanio! The king my father shall be made acquainted Of thy assault: if he shall think it fit, A saucy stranger in his court to mart As in a Romish stew and to expound His beastly mind to us, he hath a court He little cares for and a daughter who He not respects at all. What, ho, Pisanio! Go away! I'm angry at my ears for listening to you for so long. If you were honorable you would have told this story for a virtuous reason, not for the kind of goal you're after—that's as low as it is strange. You're acting wrongly towards a gentleman, who is as far from doing what you describe as you are from being honorable. You're trying to sleep with a woman who rejects you like she does the devil. Pisanio! My father the king will be told about your assault on me. If he thinks it's right for a rude stranger to bargain like he's in a Roman brothel and to speak his horrible mind to me, he doesn't care about his court and doesn't respect his daughter at all. Pisanio! O happy Leonatus! I may say The credit that thy lady hath of thee Deserves thy trust, and thy most perfect goodness Her assured credit. Blessed live you long! A lady to the worthiest sir that ever Country call'd his! and you his mistress, only For the most worthiest fit! Give me your pardon. I have spoke this, to know if your affiance Were deeply rooted; and shall make your lord, That which he is, new o'er: and he is one The truest manner'd; such a holy witch That he enchants societies into him; Half all men's hearts are his. Oh lucky Leonatus! I can say the belief your wife has in you deserves your trust in her, and your perfect goodness deserves her strong belief. May you remain this blessed for a long time! You're the wife of the most virtuous man who ever lived in a country! And you're a wife who only deserves the most virtuous man! Forgive me. I spoke this to know if you really loved him, and this news will be so welcome to your husband that it will be as though he is made new. He is one of the best-mannered people. He's so holy that it's like he's a witch who enchants people into spending time with him. Half of all of men's hearts belong to him. You're making up for your behavior. He sits 'mongst men like a descended god: He hath a kind of honour sets him off, More than a mortal seeming. Be not angry, Most mighty princess, that I have adventured To try your taking a false report; which hath Honour'd with confirmation your great judgment In the election of a sir so rare, Which you know cannot err: the love I bear him Made me to fan you thus, but the gods made you, Unlike all others, chaffless. Pray, your pardon. He's like a god on earth compared to other men. He has a kind of honor that sets him apart, which seems like something more godlike than mortal. Don't be angry, powerful princess, that I tried to tell you a lie. The fact that you could tell I was lying just confirms your good judgement, which was already apparent in your choice of such an excellent husband. You know your judgement is never wrong. I was blowing on you as though to separate wheat from chaff, but unlike everyone else, the gods made you without any chaff. Please forgive me. All's well, sir: take my power i' the courtfor yours. It's all right, sir. You'll be given all the power I have in the court. My humble thanks. I had almost forgot To entreat your grace but in a small request, And yet of moment to, for it concerns Your lord; myself and other noble friends, Are partners in the business. Thank you. I had almost forgotten to ask you for one small thing, but it's important, because it's about your husband. It also concerns me and some other noble friends. Some dozen Romans of us and your lord— The best feather of our wing—have mingled sums To buy a present for the emperor Which I, the factor for the rest, have done In France: 'tis plate of rare device, and jewels Of rich and exquisite form; their values great; And I am something curious, being strange, To have them in safe stowage: may it please you To take them in protection? About twelve of us Romans and your lord—the best among us—put money together to buy a present for the emperor. I was the agent for the others and bought it in France. It's silver carved with rare designs and well-shaped precious stones. They're worth a lot. I'm a little nervous about being able to store them safely, since I'm a stranger here. Could you keep them? Willingly; And pawn mine honour for their safety: since My lord hath interest in them, I will keep them In my bedchamber. Gladly. And I bet my honor they'll be safe. Since my husband has a stake in them, I'll keep them in my bedroom. They are in a trunk, Attended by my men: I will make bold To send them to you, only for this night; I must aboard to-morrow. They're in a trunk, which my men have. I will send them to you, just for tonight. I have to sail back tomorrow. Yes, I beseech; or I shall short my word By lengthening my return. From Gallia I cross'd the seas on purpose and on promise To see your grace. Yes, please. Or I'll break my promise by coming back later than I said. I crossed the sea from France on purpose just to see you, because I promised I would. I thank you for your pains:But not away to-morrow! Thank you for taking the trouble. But don't leave tomorrow! O, I must, madam: Therefore I shall beseech you, if you please To greet your lord with writing, do't to-night: I have outstood my time; which is material To the tender of our present. I have to, ma'am. Please, if you would like to write to your husband, do it tonight. I have been here too long, and we need to give our present as soon as possible. I will write.Send your trunk to me; it shall safe be kept,And truly yielded you. You're very welcome. I will write to him. Send your trunk to me. It will be kept safe and honestly given back to you. You're very welcome. Doyle, Clio. "Cymbeline Translation." LitCharts. LitCharts LLC, 19 May 2017. Web. 21 Apr 2019. Doyle, Clio. "Cymbeline Translation." LitCharts LLC, May 19, 2017. 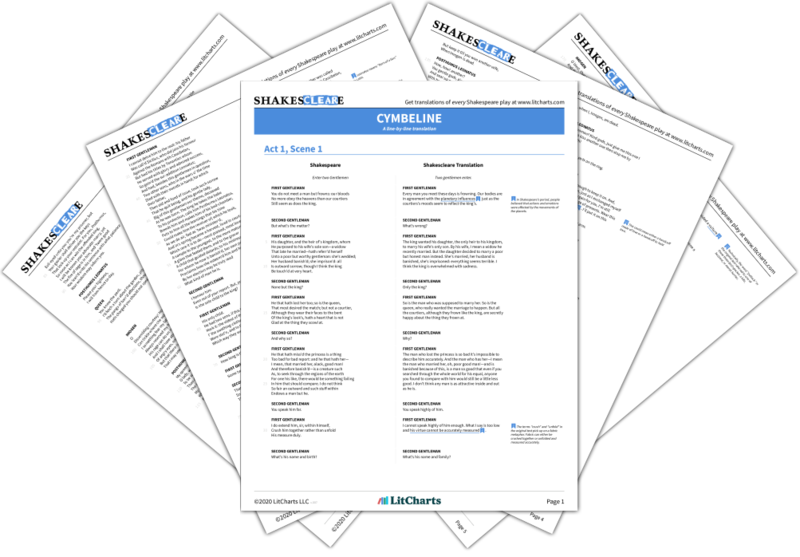 Retrieved April 21, 2019. https://www.litcharts.com/shakescleare/shakespeare-translations/cymbeline.